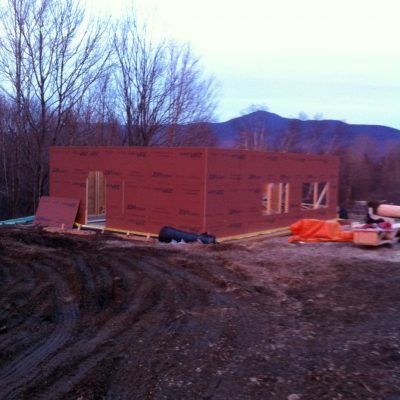 We’ve gained valuable experience in designing our first Passive House in Middlebury. 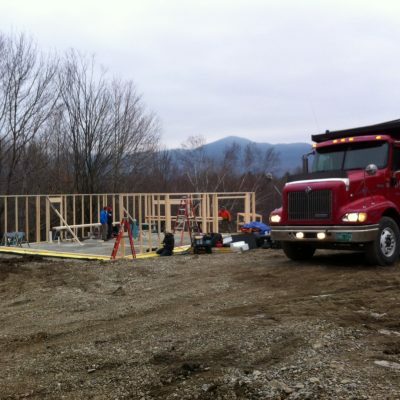 We’re putting that experience to good use with our second Passive House, this time in Lincoln, VT. 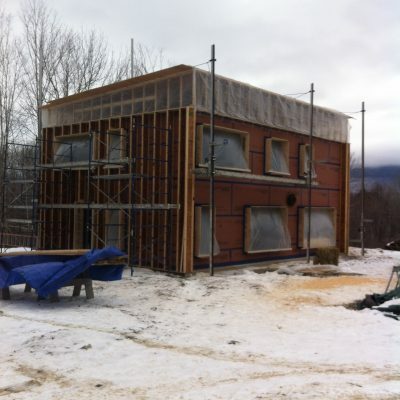 Passive House #2 is the spiritual twin of #1, but with a couple key differences. First, most obviously, is the larger lot. The Middlebury site is a snug fit thanks to several competing setbacks, so the extra breathing room on a large site allows much more flexibility in placing the house. 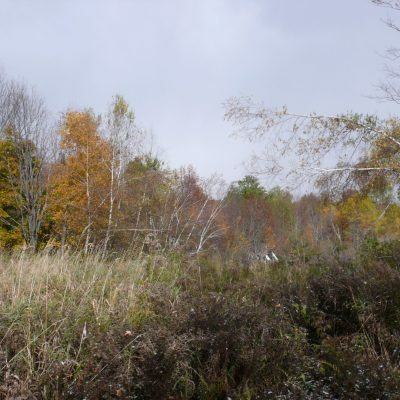 The house was placed on the north side of a clearing, so no trees had to be removed to get the best use of solar gain. Second is the foundation structure. The dramatic topography of the Middlebury lot meant the inhabitable space would “float” over an unconditioned, partially open space, using either piles or concrete walls. 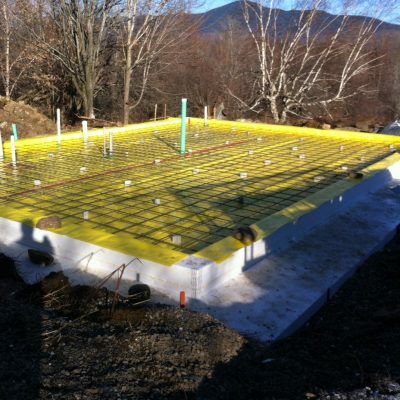 On the flat plain where the Lincoln house sits, rather than go to the expense of digging and building typical concrete foundations and then insulating the floor cavity, we decided to go with a system used often by Maine Passive House designer Chris Corson: a raft slab foundation. 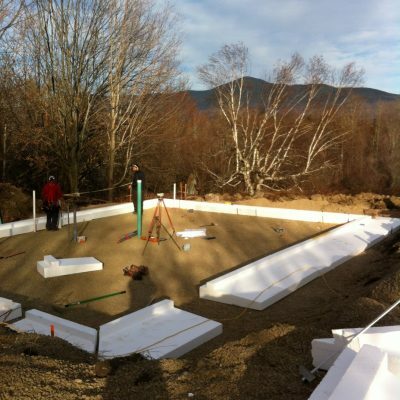 In this system, an 8″ concrete slab is poured over a raft of 12″ thick EPS foam. 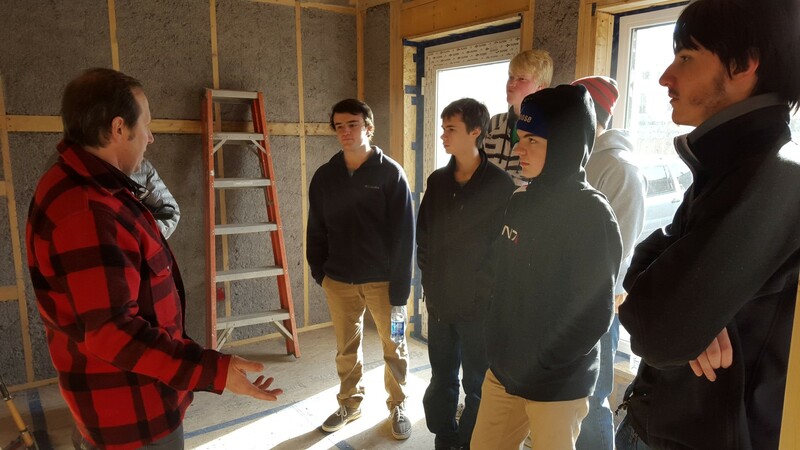 The foam works both as the main floor insulation keeping heat in the house, as well as a blanket to keep the natural heat of the earth under the building, preventing frost from forming that would otherwise affect the integrity of the foundation. 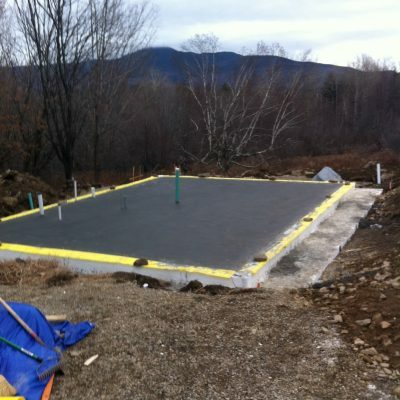 The 8″ slab is thick enough that no separate footings are required for structural reasons. But apart from these differences, the house exhibits the same beauty and efficiency as the one in Middlebury. 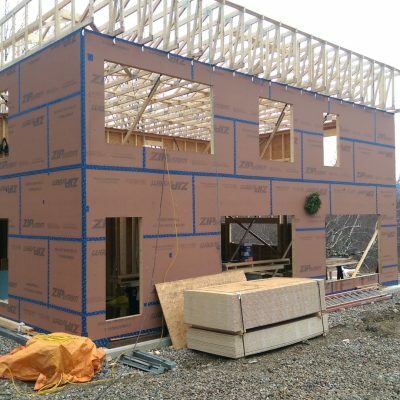 The various lessons we’ve learned and details we’ve revised from the first house have thus far contributed to a shorter period of construction relative to the first house (helped along by a very light start to winter). 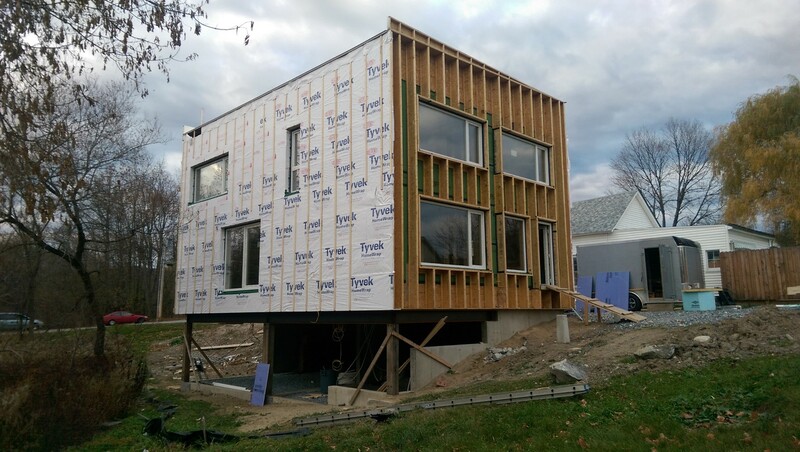 With Silver Maple Construction at the helm, we’ll have the quality of construction needed to get this house certified as the next Passive House in Vermont. 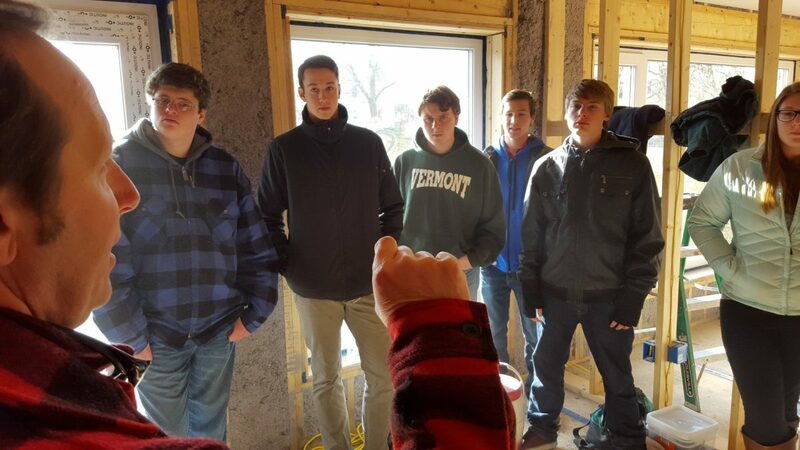 Just before Thanksgiving, the Passive House was graced by students from the STEM Academy, part of the Patricia A. Hannaford Career Center in Middlebury, VT. For anyone interested in pursuing careers in engineering and architecture, the opportunity to tour a Passive House is a chance to see the future of building standards in action. 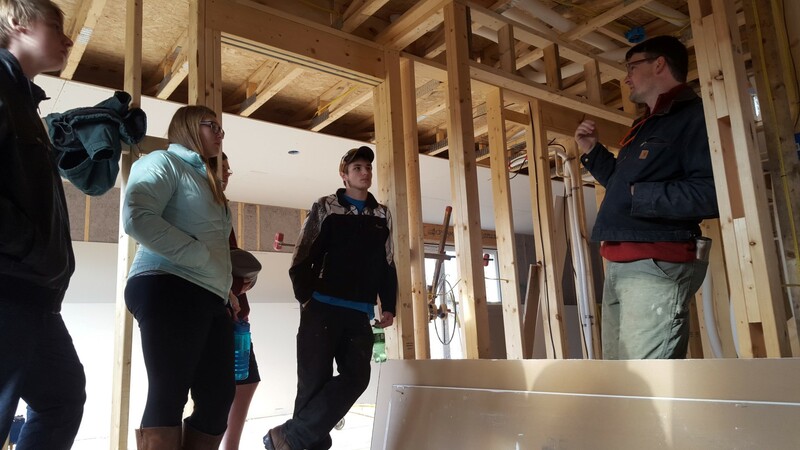 The students were guided by lead architect Gregor Masefield, founder of Studio III Architecture, and lead builder Chris North, co-owner of Northern Timbers Construction. 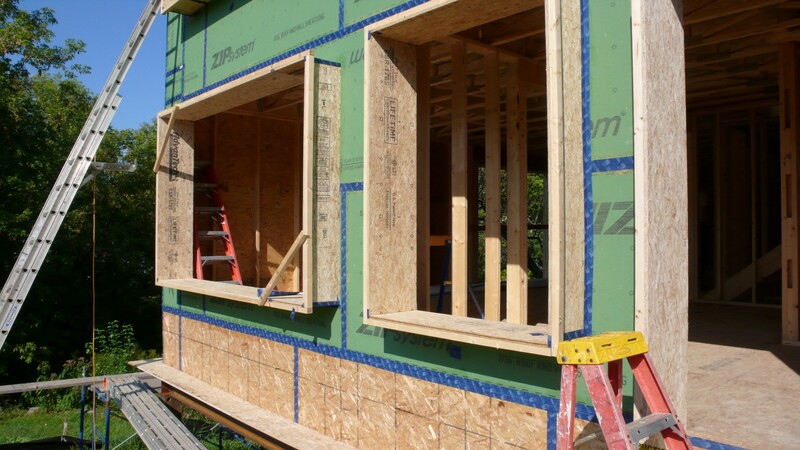 Compared to Europe, where an industry for passive building has been developing since the first Passivhaus was built in Darmstadt, Germany in 1991, passive building in the United States is in its infancy. 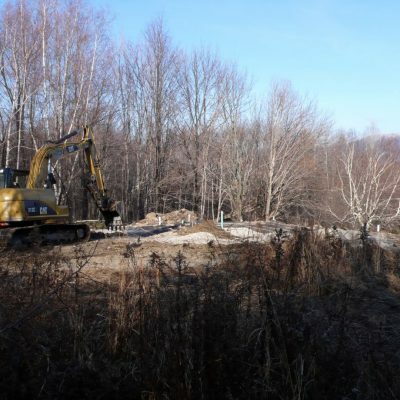 PHIUS’s database lists about 150 certified projects across the county, with only 5 in Vermont. This house will be the 6th. Meanwhile, passive buildings in Europe number in the tens of thousands. 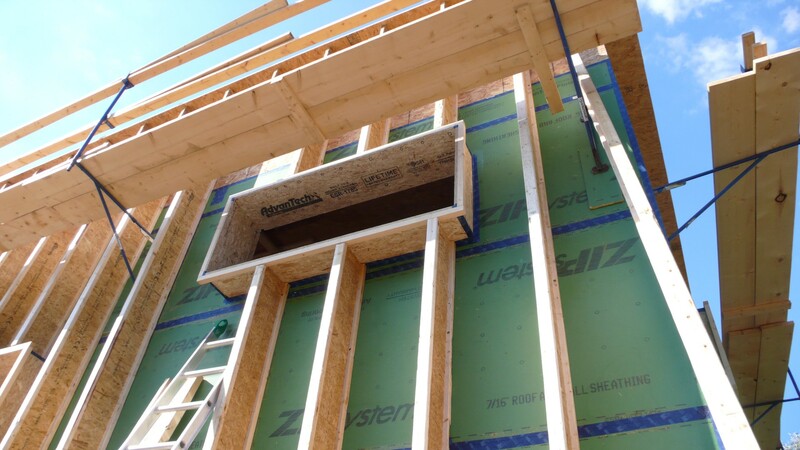 The industry there is so well-established that construction of a passive building in Germany only costs 5-7% more than a regular building, a cost that is more than made up for by energy savings over the life of the building. But even in the US construction costs only run 5-10% more for new buildings, and those costs continue to go down as the industry expands and more people come to recognize the value of the PH standard. As a consumer, you might think, “Housing is expensive as is. Why should I bother with the higher cost of construction when fuel is so cheap right now?” The price of fuel changes as often as the weather; nothing can guarantee today’s low prices won’t disappear with the next political crisis. But more to the point, we can no longer pretend that our current low standards of building are even remotely sustainable, and it is impossible to ignore the effects of poor construction on the global climate. With the international climate talks beginning today in Paris, the time is ripe for a dramatic shift in the way consumers look at construction. 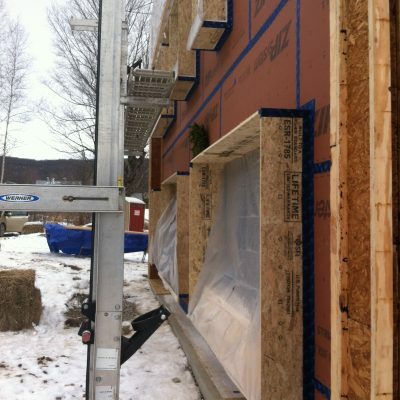 One day, the Passive House standard will be the minimum requirement for building. The sooner people adopt it not just as a building code, but as a cultural mindset, the better it will be for everyone. We hope the students came away from this tour with some insight into the exciting challenges they’ll encounter. 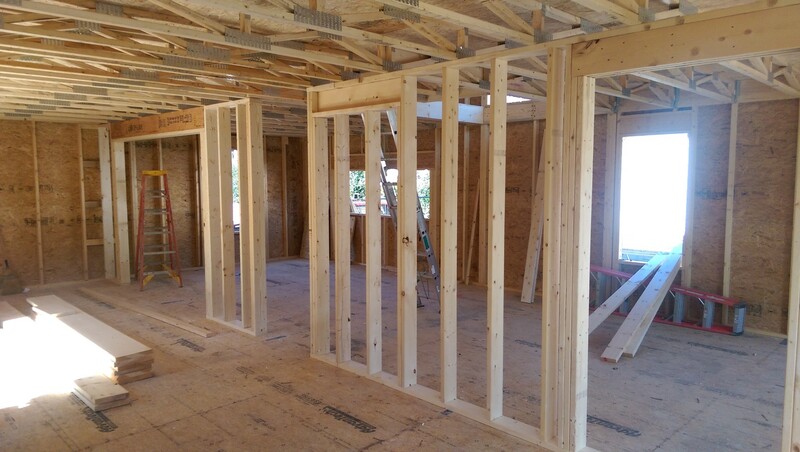 At our last update, penetrations for the utilities had been installed, the TJI’s were almost completely installed, and the windows were about to be installed. 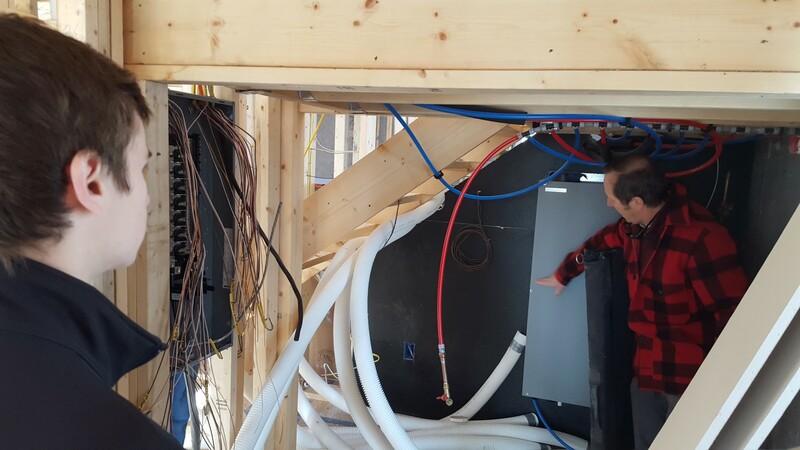 Construction was thus approaching a critical milestone: the first blower door test. 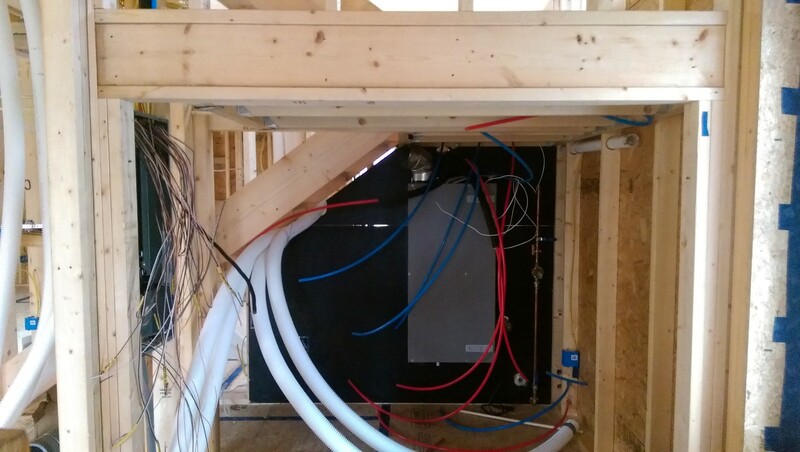 The test is simple: a box fan with a precision pressure measurement device (called a manometer) is installed and sealed to the front door opening. All the other doors and windows are closed, and the fan is turned on. The manometer then tells us how much air is escaping the building given the pressure created by the fan. 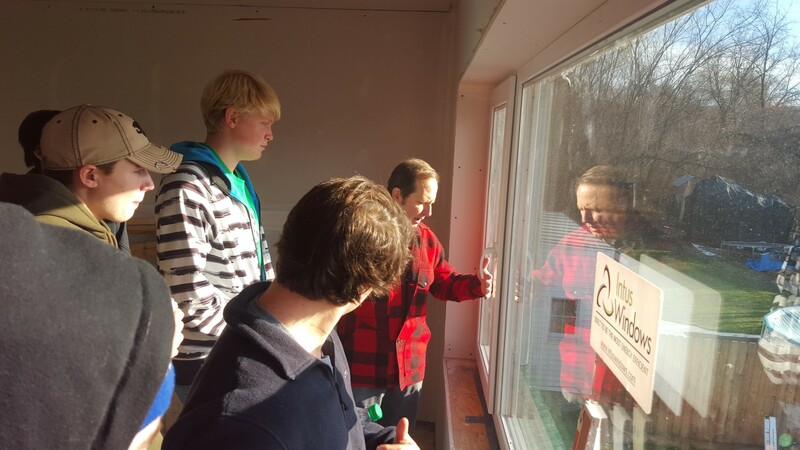 Last week we conducted the first blower door test. At a pressure of 50 Pascals, by US standards we wanted no more than 1 air change per hour (ACH). By European standards, no more than .6 ACH. The results of our blower door test? .28 ACH. Although even the US standard is high by comparison to typical construction and detailing, we not only met the higher European standard, we far surpassed it. This is a remarkable achievement and a testament to the effort Northern Timbers Construction is putting into this house. 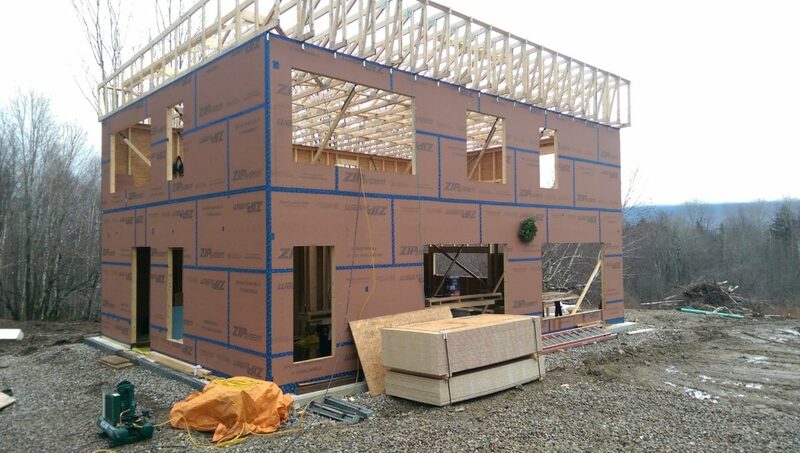 And now construction can continue – exterior sheathing is already almost finished. 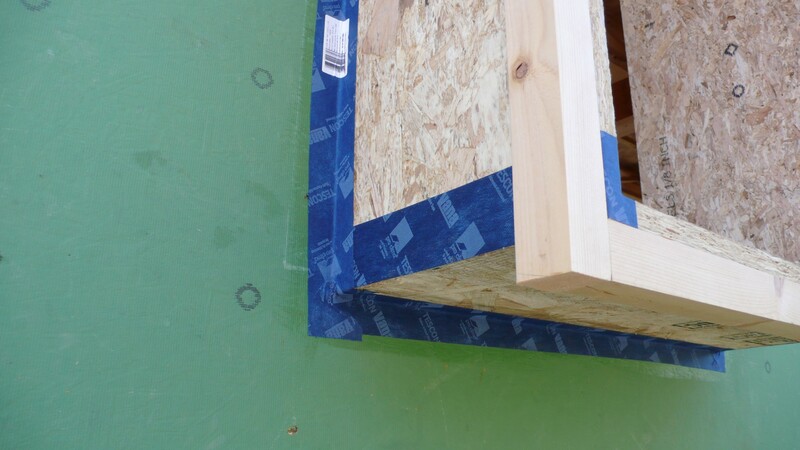 This sheathing is the last side of the box that will be filled with dense-pack cellulose insulation. It also provides a drainage plain for water. 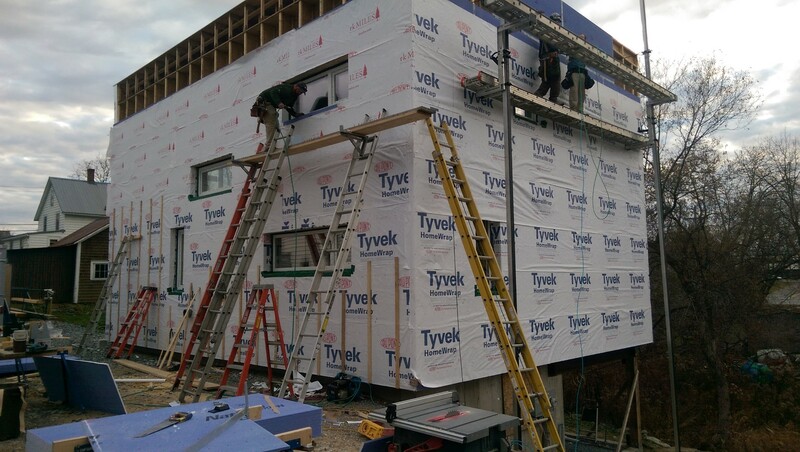 Vertical furring strips are the last step before the exterior cladding. 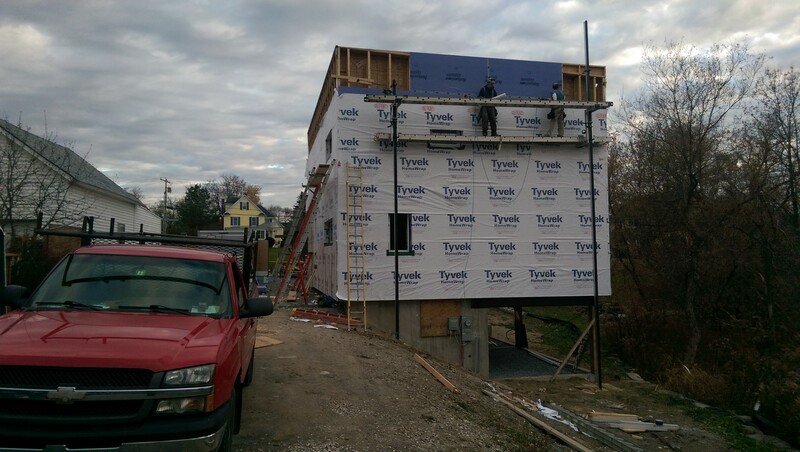 After the blower door test, we’re more excited than ever to see this house finished. 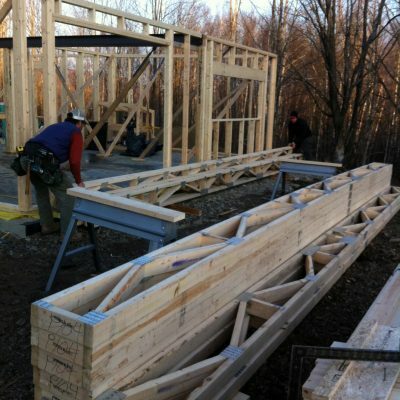 Framing continues at the Passive House. The once cavernous interior space has given way to more recognizable rooms. Along with pipes and electricity, the guts of the high-efficiency air exchange unit by Zehnder are on display. 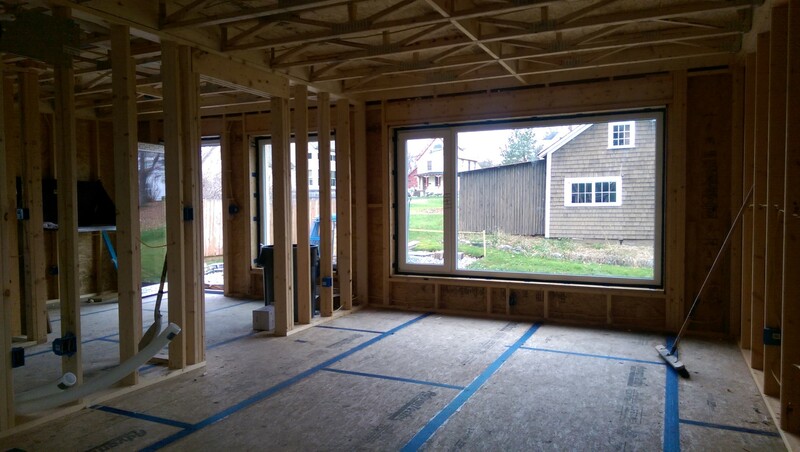 On the exterior, the window frames and TJIs have just finished being installed. 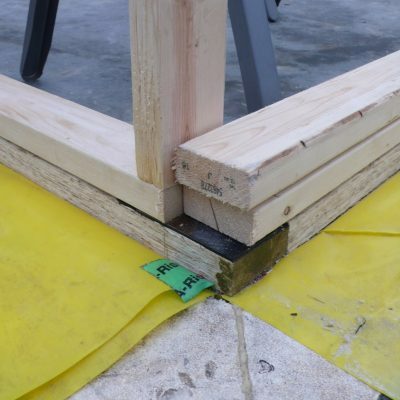 The TJIs serve two purposes: They define the box that will hold about a foot of dense-packed cellulose insulation, critical to achieving a high R-Value; and they provide the structure for the siding. However, it will be some time before the siding can be installed. First we must conduct a blower door test. There are two over the course of construction, and now that the TJIs are installed the first is right around the corner. The house is getting closer to its final shape, but there’s still much to be done for it to be certified “Passive”.